June was a particularly hot month nationally for social and emotional learning. I had the good fortune to contribute to four separate conferences and meetings dedicated to this important work, traveling to Austin, Philadelphia, Princeton, and Nashville. Does social and emotional learning (SEL) still matter after elementary and middle school? What’s the single most important element for effective SEL? How do we ensure SEL meets the needs of diverse student demographics? Austin: The “Equity Through SEL: Supporting Student Success in the Transition to Post-Secondary” conference was hosted by the ACT Center for Equity in Learning. More than invited 300 attendees, representing secondary and postsecondary institutions, included researchers, instructors, and students. For these participants, social and emotional learning wasn’t some kind of “nice-to-have” instructional supplement, it was a life-saver and a transformative opportunity-creator. The conference struck an emotional cord, more like a heartfelt gathering that at times felt more like a political rally than an academic conference. And accordingly, if we know the importance of these things to success in college and life, shouldn’t we count them more highly in the college admission equation? Nashville: The Alignment Nashville SEL conference is one of the largest national events dedicated to SEL, attracting passionate devotees who see SEL as a life calling that deeply inspires their work as educators. In the conference kickoff, Scarlett Lewis, the mother of a Sandy Hook shooting victim, spoke of her belief that evidence points to SEL being a necessary component of our children’s education and a powerful solution to the issues we face in our society today. Over the course of these four conferences, we discovered great insights about social and emotional learning. Does social and emotional learning still matter after elementary and middle school? Most certainly! SEL is not just for breakfast (or early childhood education) anymore. At three of the four June events, this question was affirmed in the central theme of the meeting. Academic preparation, researchers explained and demonstrated again and again, is necessary but not sufficient for secondary and postsecondary success; social and emotional competencies are essential. While more challenging to capture in a word or two, the passionate voices addressing this topic focused on the centrality of positive, mutually respectful and trusting relationships. From CASEL’s Roberto Rivera at the Austin conference, to Zaretta Hammond in Nashville, ensuring you are working from a human-centered place of genuine connection, caring, and trust is at the core of this work. To do this topic justice demands a discussion of a book-length or more, but we can say here that these meetings, particularly the ACT Center for Equity in Learning and the ETS conferences, treated this topic with great attention and seriousness. Here's my primary takeaway from the four events: While researchers, educators, funders, and policymakers ever-increasingly recognize the importance of SEL in secondary and post-secondary education, we are still very much in the early phases of discovering and establishing these best practices. Schools, districts, and universities can’t be expected to do this work on their own, especially beyond grade six or eight, without assistance and resources. ACT is continuing to grow its team of researchers and experienced SEL practitioners engaged in this work, supporting educational organizations in social and emotional program planning, instruction, and assessment. 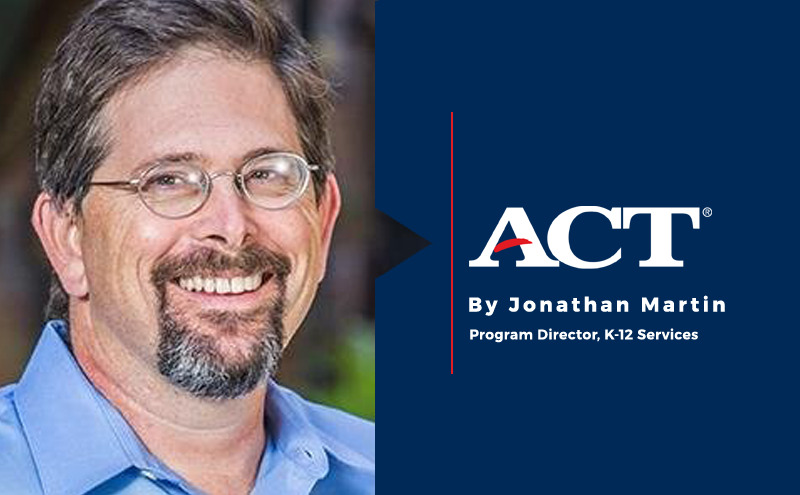 As part of its mission to help people achieve education and workplace success, ACT is advancing awareness of the benefits of social and emotional learning, learn more. Interested in how your higher ed institution can participate in new ACT social emotional learning initiatives for post-secondary students? Learn more.